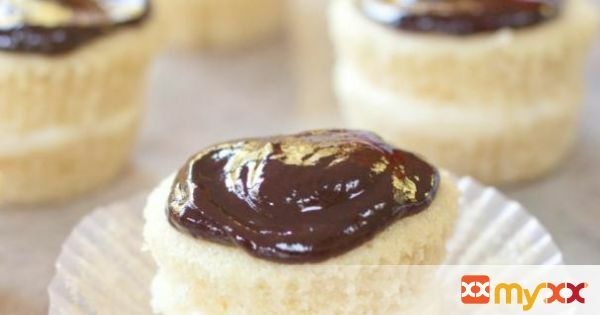 Why bake a whole cake when you can make adorable individual sized Boston Cream Pie Cupcakes?! Make them from Scratch with a homemade vanilla pudding filling and chocolate ganache topping! 3. In a stand mixer cream together the butter and sugar then add the vanilla and beat again. 4. Add eggs, one at a time, beating well after each. 5. In a separate bowl, mix together flour, baking powder and salt. 6. Add half of the flour mixture to the mixing bowl and mix until just combined. 7. Then add the buttermilk and mix again. Finally, add the rest of the flour mixture and mix until well combined. 8. Line a lightly muffin pan with cupcake liners and fill each liner ¾ of the way full. 9. Bake in oven for 18-20 minutes, or until a toothpick comes out clean and let cool completely. 11. In a medium bowl, beat egg yolks well and then gradually stir in milk until well blended. 12. In a large, heavy saucepan over medium-low heat, mix together sugar, cornstarch, and salt then gradually add in milk mixture, stirring well to prevent lumps. 13. Continue cooking over medium-low heat, stirring constantly until mixture reaches a low boil (about 20 minutes). 14. Allow to boil, still stirring constantly for 1 minute. Then immediately remove from heat. 15. Set pot in a large bowl of ice water, still stirring. 16. When mixture has cooled a bit, stir in vanilla. 17. Place a piece of plastic wrap directly on filling to prevent a skin from forming and place in refrigerator until ready to use. 19. Heat cream and butter in a small saucepan until the butter melts and the cream starts to boil, stirring often. 20. Place chocolate in a food processor and process until it’s finely chopped, or chop with a large knife. 21. Gradually add the hot cream into food processor and process until the mixture is smooth. If you don't have a food processor, add the chopped chocolate to the saucepan and mix until chocolate is melted and mixture is smooth. Remove from heat and let cool slightly. 23. When the cupcakes are cooled completely, remove from liners and slice in half with a very sharp knife. 24. Add a dollop of pudding to the center of the bottom half of the cupcake and gently place top half on. 25. With a small spoon, spoon ganache on top of cupcake. 26. Allow 30 minutes to an hour for the ganache to set.